I have not often written here about my crush on Spider-Man. However, many who I know in the online world are aware since he figures in my profile picture on places like Twitter, Instagram and Pinterest. It was therefore a hoot when I saw him grab a coffee at Starbucks. Well, I saw him on a Youtube video, of course. Still a lot of fun and imagine if the web slinger had stopped in while you were at Starbucks! Enjoy this video from the people at Sony Pictures Entertainment who brought to us the 2017 version of Spider-Man: Homecoming. I have yet to write my review of Spider-Man: Homecoming but rest assured that I thoroughly enjoyed the movie. You will, too. 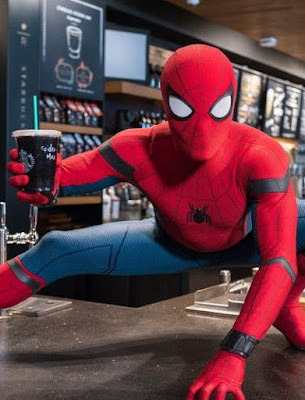 Wouldn't it be fun if Spider-Man stopped by when you were at Starbucks?